We will be pleased to see you next month. Fancy bringing a friend? Like to help out? Yes, please, you'd be very welcome. 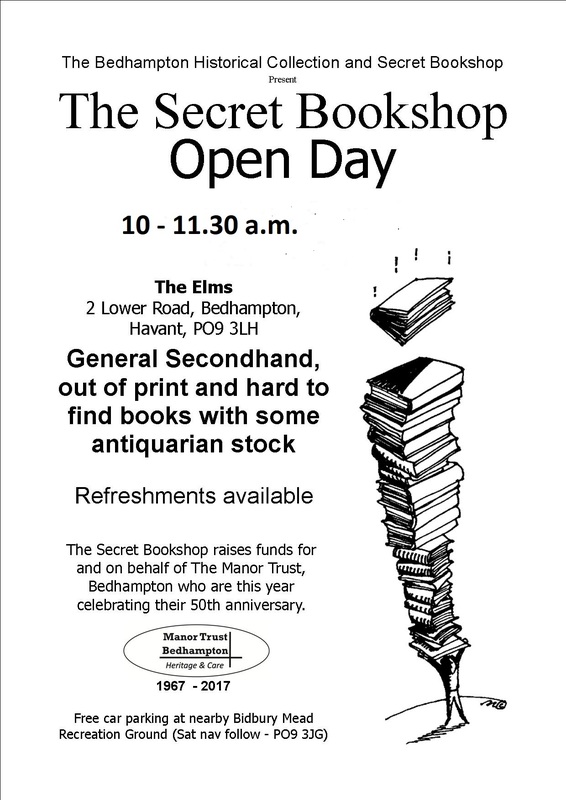 and the Secret Bookshop in the Library of The Elms will be open. 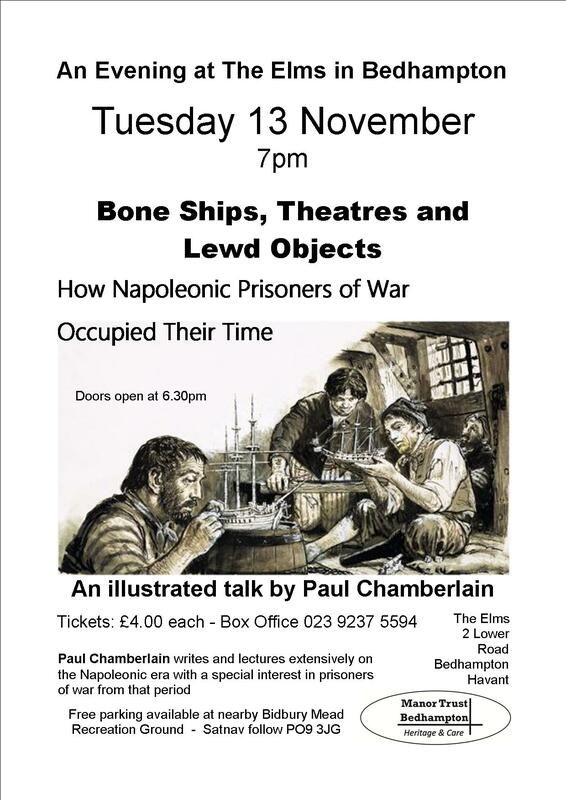 Do come and hear this very interesting talk. Our seats can easily get booked-up so we recommend that you book early. not time served in prison. But Dr Hurd's PhD is in history. She has been an Ofsted inspector for 19 years and has also inspected schools in Abu Dhabi. 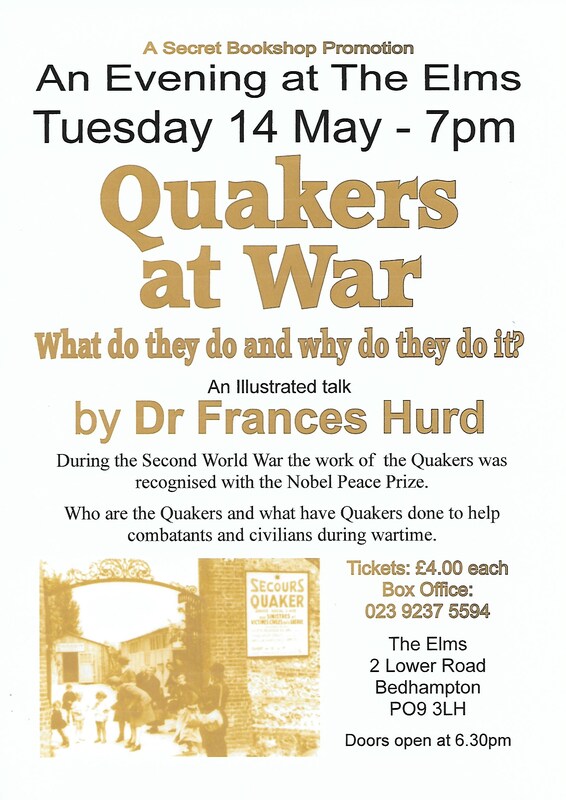 She has continued historical research throughout her life, and was one of the speakers in the Portsmouth D-Day Museum series of autumn lectures. A firm from Tongham named Portland Stone Steps came to the Elms on Tuesday 12th February and replaced the badly cracked step. The stone is in Portland Stone as was the original. Doubtless it will weather-in as time and usage goes by, and eventually look just like the step below it.There is a little touching-up of the wall paint needed and that will be done. The cost of the relacement step was met by a supporter of the Trust and of The Elms in particular and who wishes to remain anonymous. The Trustees and Governing Committee are very grateful to our supporters who help the trust in its work. John Keats was an English poet who is now regarded as being one of the greatest lyric poets of his time and one of the principal poets of the English Romantic movement. He was born in London on October 31, 1795 and in his short lifetime had 54 poems published in various magazines and in three volumes of poetry. 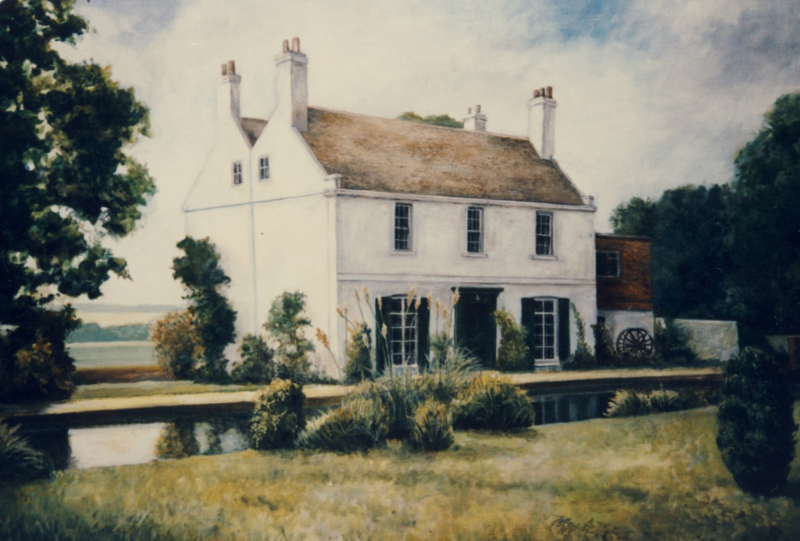 He spent some of his time living in Bedhampton, staying at the Mill shown opposite in an archival photo courtesy of The Manor Trust's Historical Collection (aka BHC) and this year Bedhampton celebrates his poems and his life that ended 200 years ago. They were a great success with many coming some distance to visit and explore the village and the special events laid on. 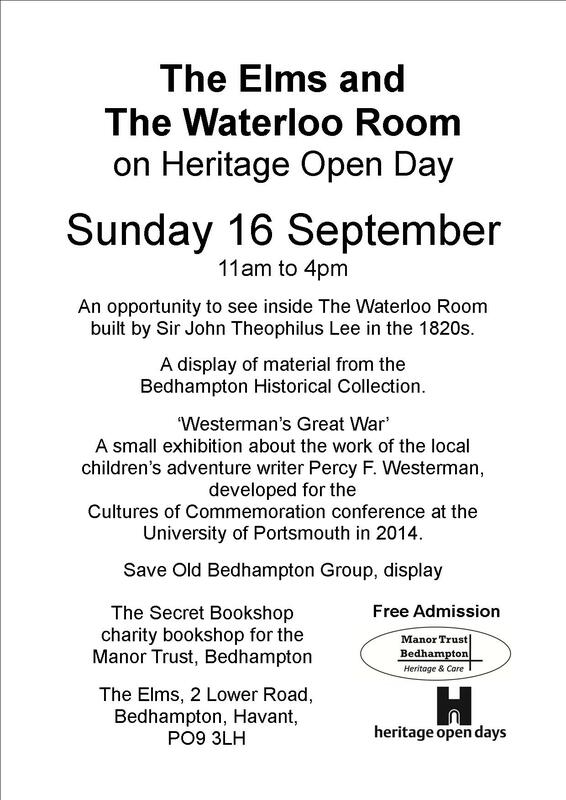 The events held in the Waterloo Room at The Elms were particularly popular as were the refreshments, and the opportunity to view the historic scroll of the full extent of Bedhampton Parish all laid out in the Elms Library where the Secret Bookskop was open as well. The organising team were led by Nigel and Wendy Gossop and congratulations are due to them all. The Bedhampton Keats 200 Group, led by Nigel and Wendy Gossop, invited a keen audience to The Waterloo Room at The Elms on Friday afternoon 15 February, to hear Havant and South Downs English Literature students read out John Keats' seven sonnets. Staff in thanking Nigel and Wendy felt the event was moving and also rewarding for the students to discover a beautiful and interesting area of Bedhampton. All who came were privileged to hear the premier of a sonnet to Keats and to hear the students reading seven of Keats' sonnets. Afterwards all were served a complimentary cup of tea or coffee. More details of these events here. Lodge Deputy Manager's long service of 30 years was recognised as she retires. The text in our latest newsletter (please see) says it all. A truly wonderful era of delivering skill with prudent wisdom. Thank you Tania from all at the Manor Trust for all you have done, and we most heartily wish you a long and very happy retirement. By popular opinion we moved the event to Saturday 1st December and it was run from 10 am to 3 pm. 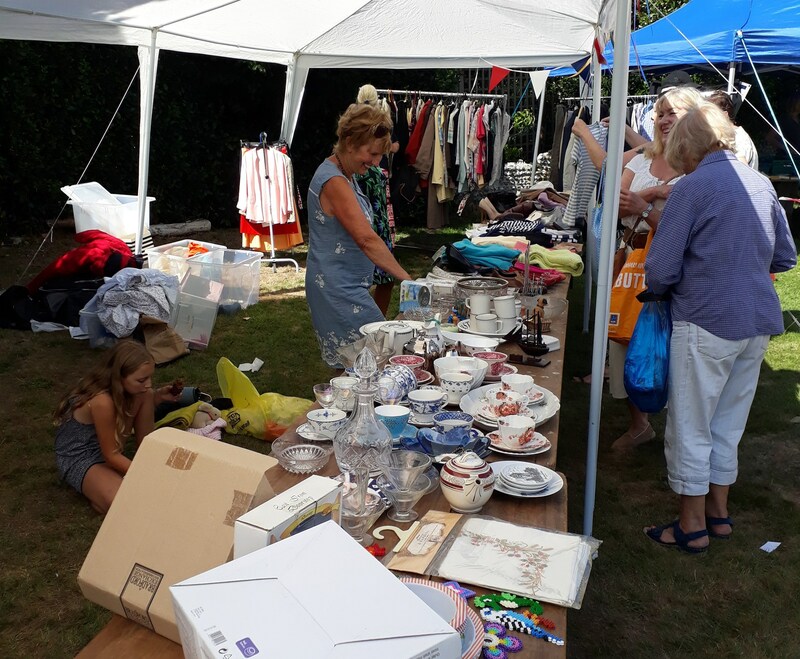 We are delighted to say that this move proved successful with more people coming and enjoying the event with fun at our stalls. Secret Bookshop was also open. and just under £900 was raised. Hearty thanks to all who came and contibuted to this happy sum raised. 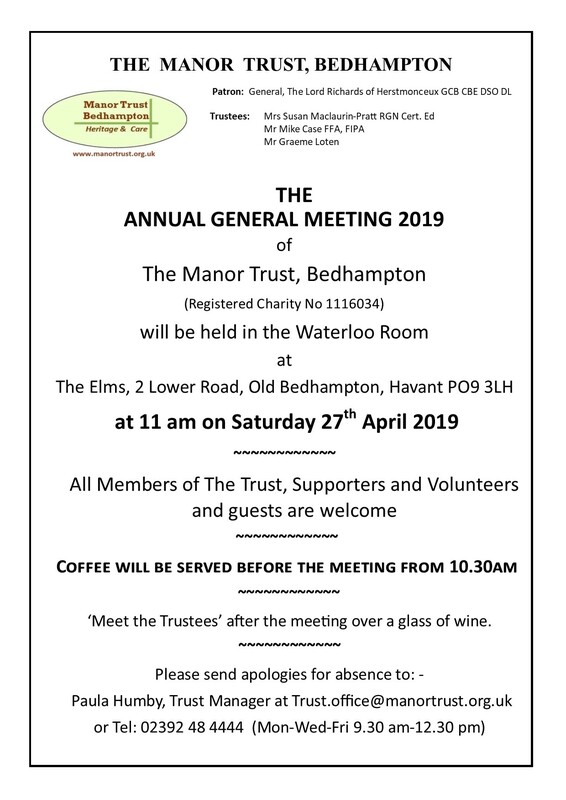 The Bedhampton Historical Collection in conjuction with The Secret Bookshop are delighted to mount this talk on behlf of the Manor Trust. Paul delighted his audience with a very interesting and for many a new insight into the subject. Many thanks to Paul for this. 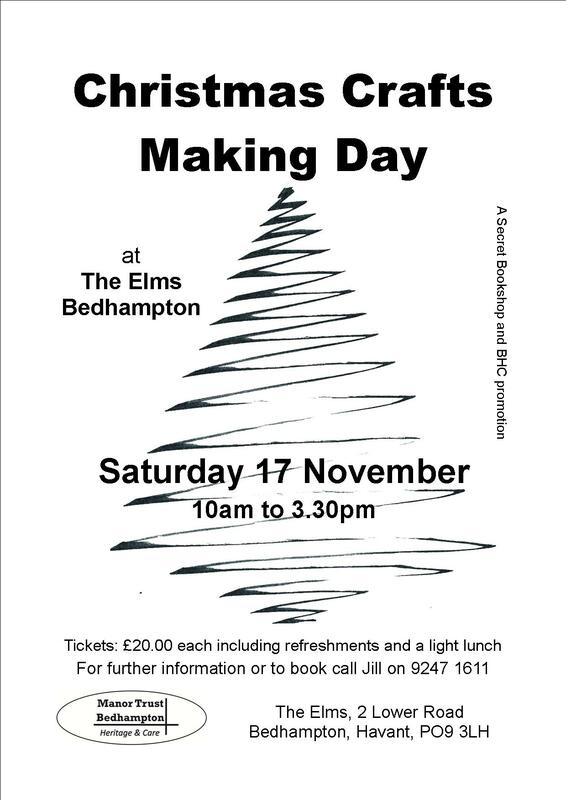 This was a successful day for those wanting to rev up their handcraft skills for Christmas fun and more. Many thanks to all who came, and most especially to Jill Munden, Wendy and others who came and oversaw the event. It is an important day in the year for the Manor Trust. of the volunteer team who run this event. to the same colour as The Tower in 2015. 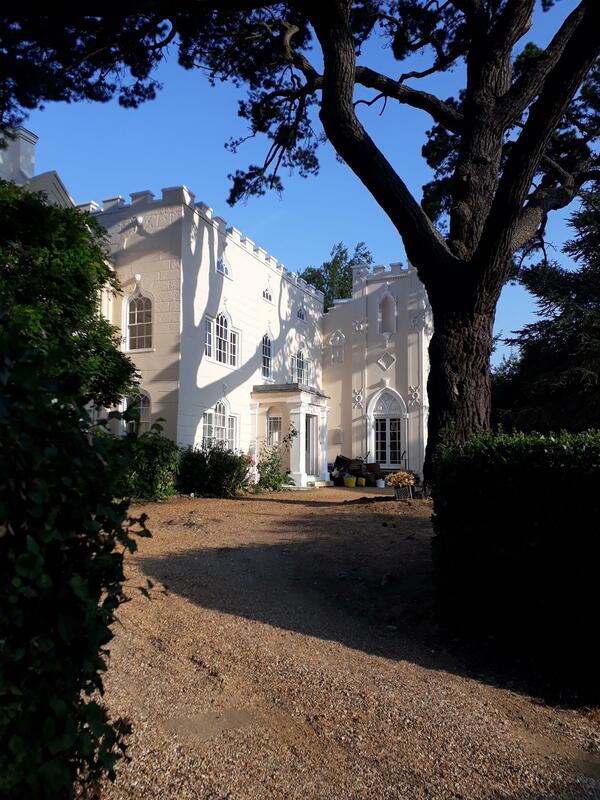 The trust has joined this organisation as it has a great support team and database for anyone who has a Listed Building, and so can ease the concerns of maintenance in compliance with planning departments whose role it is to see that the Listed Properties are correctly traditionally maintained. The Elms (AD 1800) with an even older farm-house core is a Grade II Star Listed building so that means it is in the top 8% of Listed Buildings in the country. This year the party was opened by The Mayor of Havant, Councillor Peter Wade who spent time visiting the stalls and talking to our visitors and volunteers. With more than 150 visitors at the party, it was a really memorable afternoon. 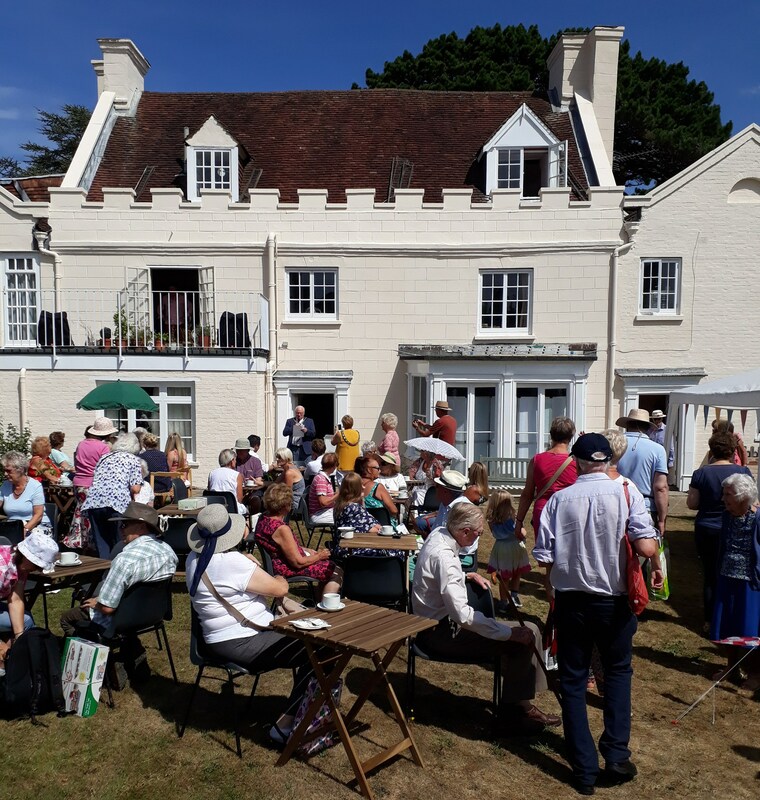 This year’s party offered a variety of stalls selling books, bric-a-brac, produce from The Lodge garden and a fantastic choice of cakes; many made by the cooks at The Lodge. It was lovely to see so many people enjoying tea and cakes on the (rather brown) lawn in the rear garden of The Elms. 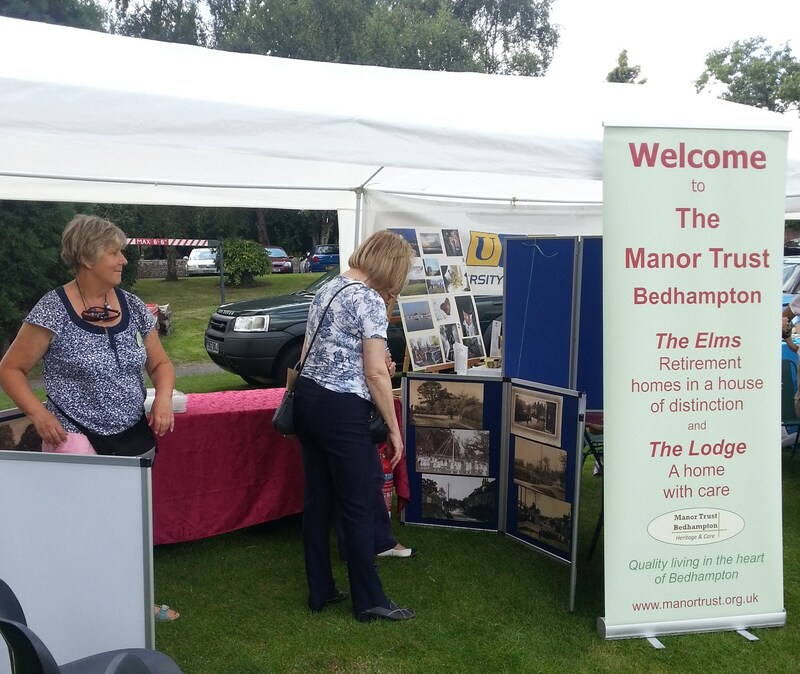 The Manor Trust would like to thank everyone who supported the annual Manor Trust Garden Party on Wednesday 1 August. 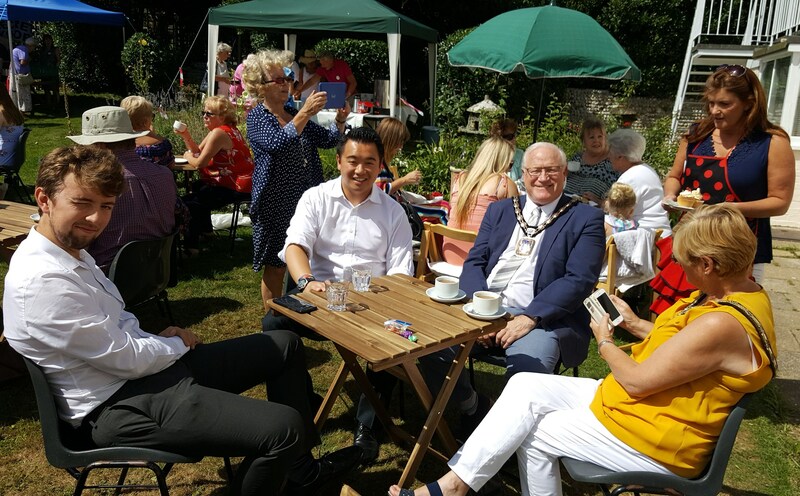 We were especially pleased that Havant's very busy MP Alan Mak found time to come and support the Trust. It was a lovely afternoon with much kinder weather than last year when we were forced to squeeze the whole party inside the Waterloo Room. Once the scaffolding had been erected, at the end of May, work could start in earnest. AlbaPlasterCraft remoulded damaged lionhhead features, and Richardsons of Gosport began the repair of the windows and repainting of the rendered walls and chimney stacks. The finishing touches will be all done by early August. The summer is the best time to renew aged gas boilers that break down when needed most and British Gas Commercial were the contract winners for the challenging task on this building. Fitting new chimney liners with the painters' scaffolding was in place was a saving opportunity the trustees were anxious not to miss. There turned out to be many 'nooks and crannies' that needed attending along with the straightforward work and this has meant that work will not be quite completed by the day of the Garden Party. At the same time, the trustees commsioned an all abilities toilet for the first time. It will be off the cloak-room that is adjacent to the Library. Visitors to the Waterloo Room will be able to use this new facility by the end of August. Join the Manor Trust Management Team. We are looking for an additional Governing Committee Member with a special interest in the elderly. No specific experience is required but a professional background is desirable and would be helpful. Our Trustees invite you to join the friendly board and give a little of your time, skills or experience for just an hour or two a month at a time to suit you in the week and a board meeting once a month. This year's Art Show went off well with many visitors. Teas and cakes were enjoyed outside in the sun on the front lawn. Grateful thanks for running this event, the preparations days beforehand, and then on each day, go to Jo Cameron for her skill on the 'Hanging Day,' and to organisers Nigel and Wendy Gossop and all the rest of the team of helper-volunteers. In particular we thank the many talented local artists for supporting our charity at this event, giving the visitors chance to view a delightful selection of fine paintings and to buy their favorite. Included in the show was the donation of a fine print of a schooner that was raffled. 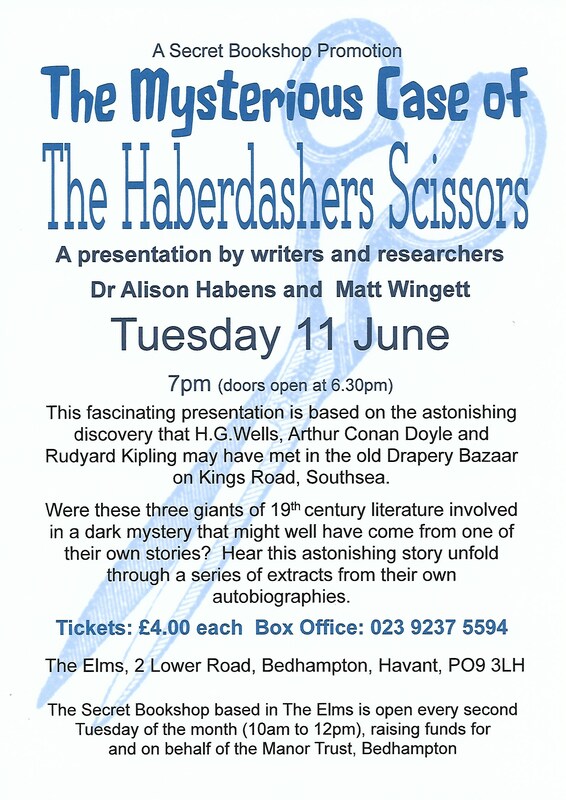 It is pleasing to note that 200 tickets were sold. You can have a cup of coffee, a piece of cake and buy a book, or two. These coffee mornings are a good opportunity to meet friends and meet new people, browse the books available at the lowest of prices, nearly all from £1. 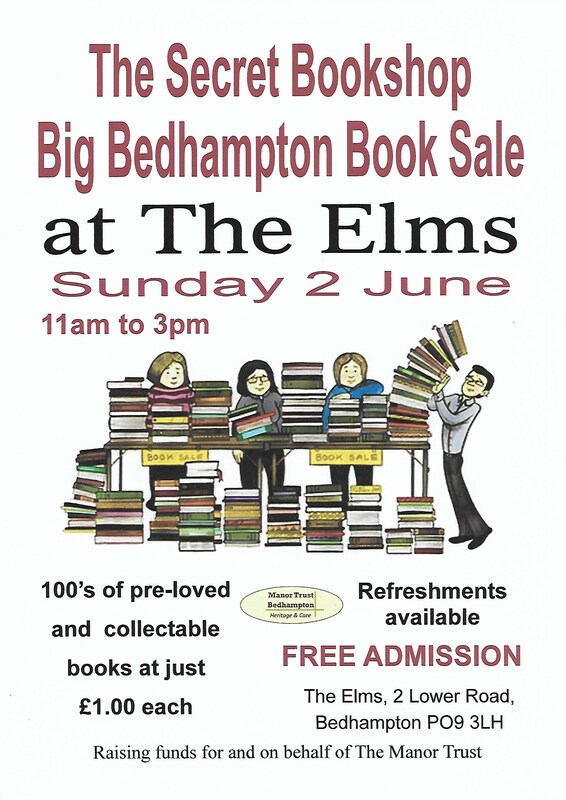 All are welcome to come and enjoy a coffee with refills, cakes etc., and an opportunity to find some new reading the Secret Bookshop. 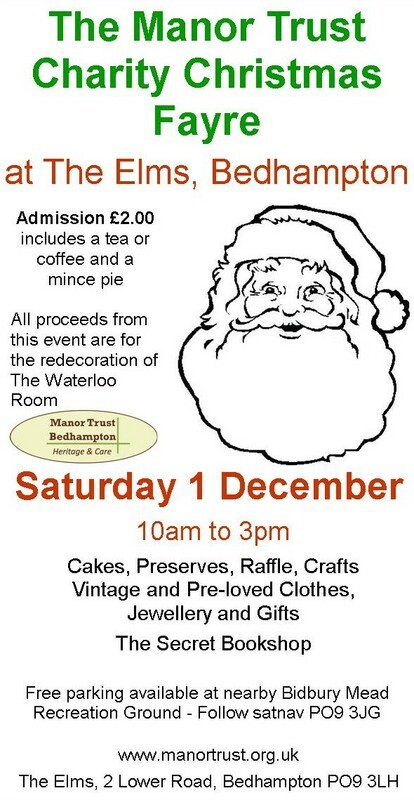 All funds are raised in aid of the Manor Trust. We are wanting to raise funds towards the renovation of the interior of this lovely Grade II* Listed Regency Banqueting Hall planned for next year. It's our endeavour that you should enjoy this experience and we will be grateful to have your support. If you would like to help with one or more of these occasions please contact our Trust Manager (see Contact page). we work towards late summer and early autumn. We are very pleased to announce the appointment of Mike Case FFA as a trustee. Mike is a Member of the Manor Trust, supporter of our events and was asked for his known professionalism in Old Bedhampton where he lives. Welcome to Mike and we hope he enjoys his new role. We are also very pleased to announce the appointment of Graeme Loten as trustee. Graeme has recently retired from government service and responded to our issuing a notice for additional trustees. Graeme lives in Bedhampton and knows the village well. We welcome him too and hope he will be very happy with his new responsibilities. Our final piece of exciting news is the appointment of Mrs Paula Humby as Trust Manager. This is a new role, and Paula will manage all those aspects of the running of the charity delegated to her by the Governing Committee and the trustees but leave the financial administration to our Trust Administrator, Valerie Moller. Between Paula and Valerie they will cover most of the weekday office hours from 1st December, Paula’s email is trust.office@manortrust.org.uk and Valerie's will be admin2@manortrust.org.uk . Both will be able to monitor each other's emails. The office phone number remains unchanged at 023 9248 4444. For public awareness the office hours for contact remain as advertised for the time being at Mon - Fri 9.30am -12.30pm. We are absolutely thrilled at Paul's appointment and we wish her every success. Of course, it will take a while for her to get to grips and 'get on top' of this new role, but we feel sure we can all bear that in mind. The Trust mounted a stand at the show, as a special attempt seeing that it is the Trust's 50th anniversary year. Many visitors came and looked at the various leaflets we had on display and available to take away. The stand was very conveniently placed close to the entrance from the car parks. Of great interest were the historic photographs of Old Bedhampton depicting scenes of the village from the earliest days of photography, all held at the Trust's Bedhampton Historical Collection. The photographic display was mounted by two from the BHC team, Nigel and Wendy Gossop, and our thanks go to them, and to Julie, a resident within the Trust and her sister, who talked to the visitors about the Trust and 'signed' up more Friends of the Manor Trust'. Throughout the whole day trustee Rhona Stokes was on hand and worked hard to make the whole display work for the visitors, and so much thanks go to her on behalf of the trustees. In all it was a successful day and worth all the effort.